To see the Karnataka flag as a threat to India would mean seeing the idea of India through a BJP prism. In the melee over the Karnataka government’s announcement to have a separate flag for the state, New Delhi-based TV channels aggressively questioned the move as a threat to the unity of the country. At the same time, Bengaluru-based Kannada channels largely supported and hailed the move. 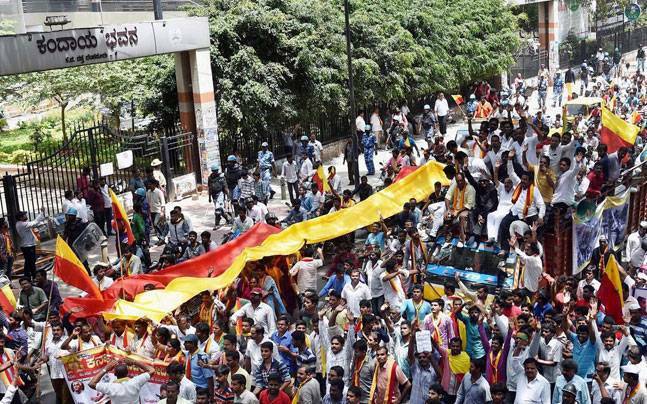 They did not see it as a threat to the unity of a nation, and instead saw it as a symbol of Kannada pride. To an observer of the news, it only reflects the cocoons that journalism and perhaps the idea of India is trapped in, depending on where people are looking from. This is not about patriotism or about being Indian, but about a disconnect in understanding India between New Delhi, its present political dispensation, and the southern city of Bengaluru ruled by the Congress party. Let’s set aside the fact that the flag was purely an electoral gimmick in a poll-bound state. The reactions and emotions the decision evoked is substance for a deeper analysis. It’s not clear at what time in our independent history reiterating a linguistic identity became inconsistent with the identity of being Indian. Linguistic division of states was implemented in 1956 purely to recognise fiercely-independent linguistic identities, especially in south India. Till the early 1960s, states like Tamil Nadu had openly raised secessionist demands, but those years gave way to a new and powerful India where a Dravida Munnetra Kazhagam could assert to be Tamilian and Indian. Through the seven decades as a nation, the idea of India as a conglomeration of diverse cultural identities had matured to mean that both a regional or linguistic identity can co-exist with a national identity. States have their official song, bird and emblem, and one state deciding to have a flag is no different. A Congress-ruled state government deciding to have a flag for Karnataka is a reassertion of a linguistic or state identity. It’s a challenge not to the idea of India, but a mere political counter to the forceful use of Hindu nationalism by the Bharatiya Janata Party. ‘If you portray yourselves as champions of India, we will portray ourselves as champions of Kannada’: this is all that it means. The reason it’s a strong counter is because Hindutva as an idea aims to create a homogeneous national identity, thus electorally uniting the various sections of Hindu society and hence achieving power. The moment linguistic, regional or caste identities are evoked, there is a division within the electorate and hence a threat to the BJP’s ability to capture power. The debate has to centre around ‘Hindu versus non-Hindu’ for it to achieve electoral consolidation. This is why the BJP has accused the Congress of “divisive” politics when caste or linguistic issues are brought up. But in this fierce portrayal of the Hindu nationalist narrative, revolving around one leader as the champion of the nation, the plurality and space for expression of other identities is lost. Further, the language of Hindu nationalism is largely Hindi, the language the prime minister delivers his speeches in, and the crux of the perceived threat to south Indian languages is the imposition of Hindi. This is perhaps the reason the BJP, or Modi’s brand of politics, has not been able to make decisive inroads into large parts of south India, like Tamil Nadu and Andhra Pradesh, where linguistic identities demand that the idea of India be seen as one of co-existence. Much of the Hindutva onslaught is lost in translation. It might have found resonance in small urban sections and among upper castes, but has not been able to impress the electorate by and large. Coalition-era politics, over the last two decades, has further strengthened these linguistic identities. Even though Karnataka has been ruled by national parties, the love for Kannada and rejection of Hindi are strong sentiments here. While the state flag decision has been questioned by BJP’s national leaders, there is a studied silence from its state unit. The problem for the BJP seems to be that with its nationalist onslaught, it’s not able to balance or defend its regional identity. Linguistic chauvinism is not a new trait in India, it has only found a new position as the Congress’s counter to BJP’s Hindu nationalism in Karnataka. So while people may question it as another jingoistic political exercise to woo the electorate, or even challenge it as not being secular, to see the Karnataka flag as a threat to India would mean seeing the idea of India through a BJP prism. The constitutional idea of India has matured, and is firm and strong in the state of Karnataka, no matter which party wins or how many flags fly.